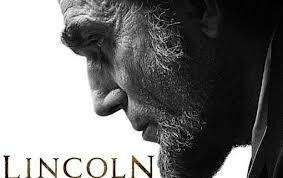 I found “Lincoln” to be a great movie indeed. Of all the US Presidents, Lincoln is probably the best known and admired by non-Americans (with the possible exception of Obama). I am the President of the United States, clothed in great power. You will procure me those votes! His demand made me wonder whether by “stooping to buy votes” Abe was unethical. A visit to Wikipedia to check on descriptions of ethics revealed to me the three broad ethical “standards” of virtue, duty and consequences. By all three I cannot fault what this courageous President did. I must confess that I was comforted that he HAD acted ethically. The only problem with that approach is then we get the leaders we deserve! This three-stage construct aligns to my previous post comparing Snowden & Jaques! Coordination – Connecting – Protecting: Eureka! I have become a big fan of Dave Snowden’s work (not the guy currently sitting in the Moscow airport; he’s the upstart, Johnny-come-lately Snowden). 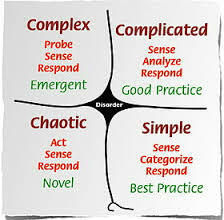 A senior client first told me about Cynefin about six years ago…I’ve been hooked since then. Here it is again in all its startling beauty! It reminds us that not all situations we encounter are “Simple”; if they were Best Practice is king and “big data” has all the answers! But we know it is not so. Things are often “complicated”. That’s where your experts and MBA’s can save the day…here analysis is tops! We all of course know things can get “chaotic”. Here every disaster and debacle shows off its novel nature. Here an action response is called for (with a very brief pause for sensing in between). But wait. I’ve left out the “Complex” domain. This is where the wonderful/scary phenomenon of emergence happens. This is where wise folks don’t rush in, seeking rapid resolution. They know they need to be much more reticent/respectful/reserved. Dave Snowden counsels them to then proceed as follows: PROBE -then- SENSE -then- RESPOND. It has a tetrahedron in each “quadrant” with differing amounts of solid and dashed lines. It then goes to show how the role of hierarchy declines, and networks increases, as one proceeds from Simple to Complicated, etc. Notice it does not say hierarchy is defunct. It states where hierarchy is best used and where its application becomes problematic. That reminds me of Elliott Jaques Requisite Organisation, or stratified systems theory as it was called earlier. I have written about it here and here before. His associates and colleagues have wonderfully extended his work and so made it even more accessible. I have shown examples of the latter’s efforts before. I’ll do so again here and then attempt to link it to Verna and her team’s insights! So I agree with Verna & team that hierarchy has a central role in organisational life where ORDER prevails. With the onset of UNORDER (complexity & chaos), networks are the way to go. BUT HERE’S THE POINT. Not everyone in the organisation needs to be “networked”. This fluid/dynamic/ambiguous networking role is played by a relatively small percentage of the organisation’s inhabitants. The majority of its inhabitants are largely insulated from this frenzied turmoil (or ought to be if the “leaders” are doing their “boundary management” job sufficiently). Complexity economics is … a different way of thinking about the economy. It sees the economy not as a system in equilibrium but as one in motion, perpetually “computing” itself—perpetually constructing itself anew. Where equilibrium economics emphasizes order, determinacy, deduction, and stasis, this new framework emphasizes contingency, indeterminacy, sense-making, and openness to change. There is another way to say this. Until now, economics has been a noun-based rather than verb-based science. It has pictured changes over time in the economy function as changes in levels of fixed noun-entities—employment, production, consumption, prices. Now it is shifting toward seeing these changes as a series of verb-actions—forecast, respond, innovate, replace—that cause further actions.